I'm baaack! Sorry for the delay in blogging, but I was really enjoying time off the computer. We had an amazing 10 days in Scandinavia. Amazing. 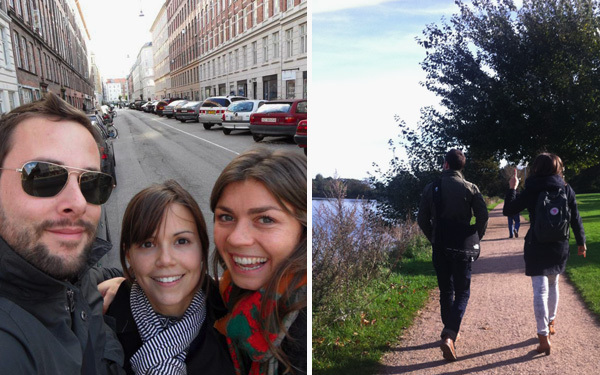 We love Stockholm and Copenhagen. I think they might be our new favorite European cities. Until I can get caught up on email and work, here's a look at our trip. Stockholm and Copenhagen are similar, yet so different. 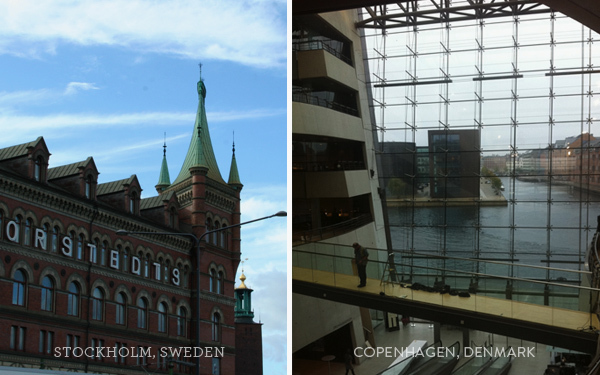 Stockholm has more traditional architecture and Copenhagen has very modern architecture. It was interesting walking around Copenhagen and seeing the modern juxtaposed with urban graffiti and a large commune inside the city. 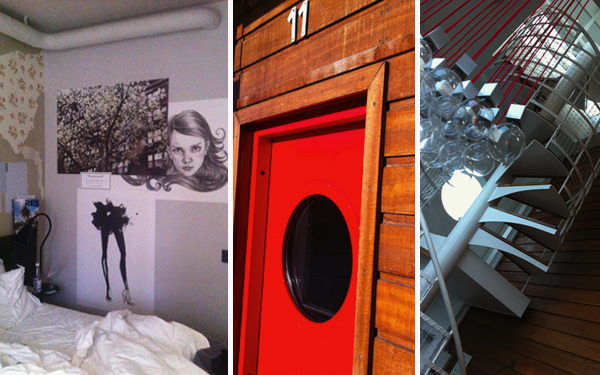 We stayed at the trendy Story Hotel in Stockholm and on a beautiful boat in Copenhagen. Both were great, but I think we preferred the boat. We had the most magical view of the city from our room—one entire wall was windows—and from the rooftop deck. Also the hosts, Henrik and Henrik, were very friendly and hospitable. Breakfast was included in our stay at the Story Hotel. Every morning there was yogurt, museli, fruit, Swedish cinnamon rolls, tons of different breads, salmon, cucumbers, cheese, strawberry juice, tea and coffee. Bread and crispbread (crackers) were served at every meal in Sweden. We ate a traditional Nordic meal on the first day we arrived in Sweden—salmon and herring—but decided to try some other types of cuisines (we're not huge seafood people). 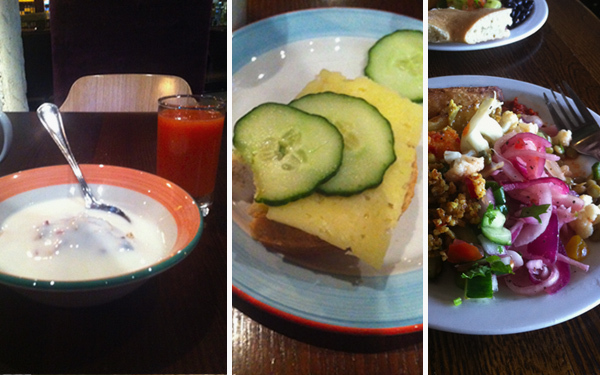 We did find a vegetarian haven in Stockholm and had a delicious lunch with a great view of the city. Oh and thanks to Sarah for recommending the Lagkagehuset bakery in Copenhagen, which happened to be minutes from our hotel. We went three days in a row for delicious pastries and coffee (why not, we were on our honeymoon). 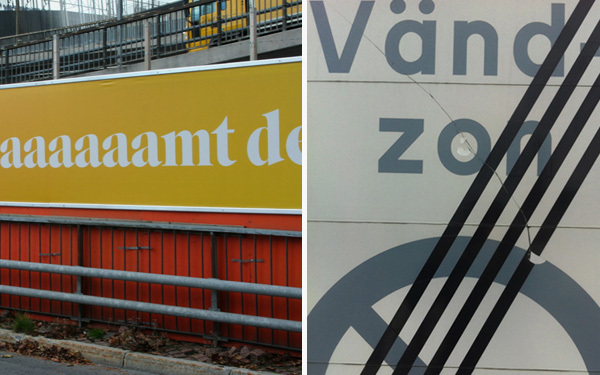 Some graphic signage we saw in Stockholm as we walked and walked and walked around both cities. You see more of a city this way rather than taking the bus or metro. We saw the opening of Nick Brandt's show—we randomly met his mother later that night at dinner—at the Fotografiska Museet and enjoyed a delicious chocolate terrine, beer and coffee at the cafe there. 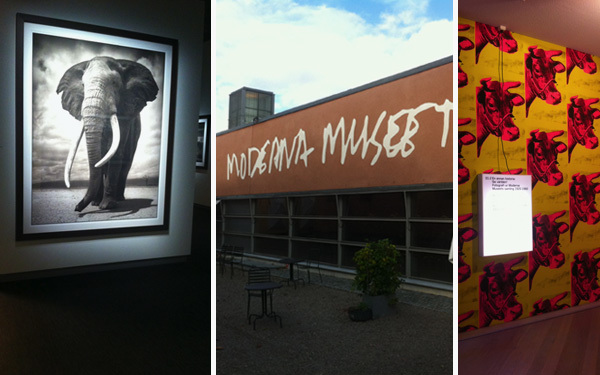 We also went to the Moderna Museet, just missing the Barbara Kruger exhibit, but they do have a lovely collection there. 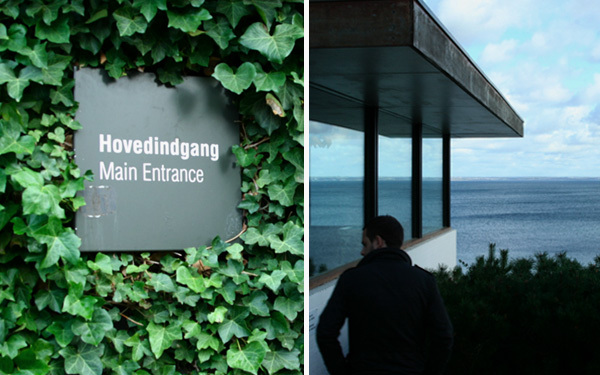 The Louisiana Museum of Modern Art outside of Copenhagen was the best museum we visited (I love that it's called Louisiana). It's right on the coast and you can see Sweden across the sea. It was huge with a labyrinth-like layout and a sculpture garden. There were doors everywhere so you could leave the museum and walk through the gardens at anytime. We were joined in Copenhagen by my dear friend, Barbara. We studied abroad together in London in 2005 and have remained close. It was so great to catch up with her over coffee, meals and walking around in Copenhagen together. Oh and thank you for all your kind words about our wedding. It means a lot. 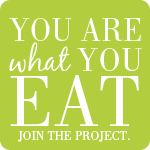 Enough personal stuff, food posts coming soon! Welcome back! I can't wait to see how your trip inspires your cooking now. :) Looks like you had a wonderful time. Such beautiful cities! Welcome home! This made me totally home-sick for Scandinavia! So glad to hear you had a good time! Thanks for kind words! We had an amazing trip! I just found your blog via a friend and I love it! Congrats on the marriage (I actually got married the weekend after you did, AND we're hoping to go to Copenhagen for our honeymoon later this year!) and best of wishes for your future. Your recipes look incredible, I'm adding you to my blogroll and I'll definitely be checking back in. Thanks Matt! I think that friend might be David Zell!? You should definitely head to Copenhagen, it's an amazing city. I'm glad your spending some time away from the computer. I think that can really be a good thing for people.